Our 4 year old daughter Abby spends her days seriously believing she is Tinker Bell and has been dressed up in fairy wings most days since before her 1st birthday. She's already been Tinker Bell for Halloween so I told her to pick something else so she said, "OK OK...the Tooth Fairy!" Me being a first grade teacher turned stay-at-home mom I got right to work! I took the little tooth boxes that I used to send my students teeth home in when they lost a tooth and used them to make the bracelet and adorn the Tooth Fairy crown and flower on her dress. The toothbrush wand is Abby's favorite part of her costume...the large tooth on top came from my dental hygienist along with the one covered in glitter inside the flower on the front of the dress. 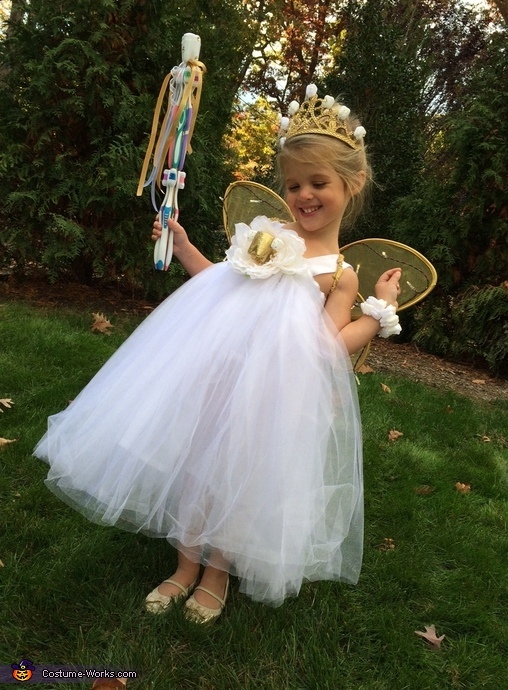 The gold wings came from Abby's fairy dress up collection but I added battery operated lights as a special touch...you know the Tooth Fairy does all her work at night! So cute! Very creative! Love her costume! The toothbrush wand is my favorite piece!!! !